January is National Mentoring Month. Mentors can play an important role in young peoples’ lives and the need for mentors has never been greater. This month we’re sharing stories of mentors and mentees. From the minute I joined the theatre department my freshman year in high school, it became my home. Mrs. Lynn Jensen took me under her wing and helped me grow into the strong woman I am today. She listened to me without judgment, always offered incredible advice, and pushed me to work harder. Without her, I don’t know who I would be. Though I was only in a few shows directed by Mrs. Jensen, she helped me hone my skills in every department. She never failed to keep time open to help me explore my interests in the theatre world. She let me costume a show my freshman year just to give me something new to try, not realizing that she was directing me to my new passion. Since then, I have costumed more than 20 shows. When I expressed interest in managing and “front-of-house” duties, she helped me learn the box office system and made time in her busy schedule to sit with me and teach me how to write receipts, apply for rights to a show, and read contracts. My senior year, I was interested in directing a one act play, and instead of laughing me off she trusted me to choose a script, audition and choose a cast, and design the entire show. Her constant love and support pushed me to become a better artist in all aspects of the word, and for that I cannot thank her enough. As graduation day drew near, I thought I was set on what I wanted to do in college. However, as soon as I began my freshman year of college, I felt out of place. In my high school department, I was often in a position of leadership; I was the president of our thespian troupe for two years, head of the costume crew, and typically the point person in charge during rehearsals. In college, I was just another freshman, one of 37 theatre majors all hoping to learn our craft and join the world of professional actors and technicians. When I expressed this worry to Mrs. Jensen, she encouraged me to keep pushing and to explore new areas of the theatre at my new school, as something would be right there for me. As usual, she was right. I applied to be the assistant director of the middle school drama club in town and got the job. 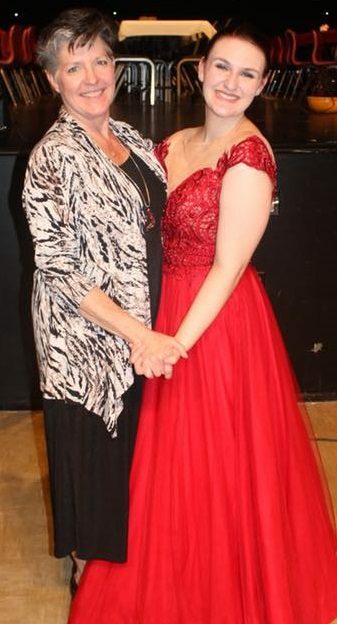 After relaying my excitement to Mrs. Jensen about the new job and the possibility of switching to a theatre education major, she told me she was “just waiting for me to figure that out on my own” but she “always knew that I would make an excellent theatre educator.” Before I even knew what I wanted, she did. Now, I am happily directing at the middle school and pursuing an education degree. Without Mrs. Jensen, none of it would be possible. She has always been my inspiration, voice of reason, and biggest fan. Bre Kenney is a freshman Literature with a Writing Emphasis and Theatre Studies double major at Saint Mary’s University, Minnesota. After graduating, she will join the one year intensive master’s program to get her masters in English Education. When not in class, Bre can often be found at the local middle school, where she is the assistant director of the drama club. Outside of school and work Bre enjoys reading, performing, and keeping up with the latest Netflix Originals. Follow her adventures at https://bxkenn17.wixsite.com/bresbookclub .